NewYork-Presbyterian Westchester Division is part of NewYork-Presbyterian Psychiatry, the #3 Psychiatry Program in the US according to the US News and World Report. Located in White Plains, New York, the beautifully landscaped grounds cover over 200 acres, and the gracious buildings, many of which retain their original historic detail, together provide space for specialized services and therapeutic activities. The 270 bed hospital provides inpatient and outpatient services to children, adolescents, adults, and older adults. Staffed by Weill Cornell Medicine clinicians, our mission is to provide patient-centered care in a facility specifically designed to offer tranquility and activities that support mental health healing. Here, we work to further the understanding of mental illness and advance clinical treatments. We provide advanced diagnostic capabilities for complex, refractory psychiatric illnesses together with comprehensive, evidence-based treatments guided by breakthrough research. All of our patients receive a comprehensive evaluation and are directed to the most appropriate level of treatment. Our staff offers services to children, adolescents, adults, and older adults ranging from inpatient treatments to ambulatory programs varying in intensity and frequency of visits. NewYork-Presbyterian Westchester Division and the NewYork-Presbyterian/Weill Cornell Medical Center Psychiatry Program have received national recognition for excellence in nursing from the American Nurses Credentialing Center’s (ANCC) Magnet Recognition Program®. The ANCC recognizes health care organizations whose nursing teams consistently deliver excellence in patient care with the highest levels of professionalism and innovation. This recognition is considered the gold standard and comprises a select group of 8 percent of hospitals in the United States. NewYork-Presbyterian/Westchester is the first behavioral health hospital in the nation to be formally named by Planetree Inc. as “Gold Certified for Excellence in Person-Centered Care™.” Planetree is an international, non-profit organization that promotes the development and implementation of innovative, patient-centered models of care delivery. 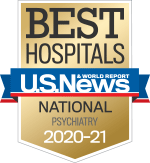 This prestigious honor recognizes NewYork-Presbyterian Westchester "as a leader in providing patient-centered behavioral health care, support and services." Visit NewYork-Presbyterian Psychiatry for more information. The Center for Autism and the Developing Brain serves the needs of patients with autism spectrum disorders and other brain development disorders. Serving patients of all ages, the Center provides comprehensive, integrated clinical care in a patient- and family-centered environment. Patients benefit from an array of diagnostic, early intervention, and multidisciplinary therapeutic services. The Center offers parent support groups, family education, and counseling, as well as gap services to aid families during planning for future treatment and utilization of community-based resources. A collaboration of NewYork-Presbyterian, Weill Cornell Medicine, and Columbia University College of Physicians and Surgeons, in partnership with New York Collaborates for Autism, the Center is located in a historic former gymnasium that has been redesigned to provide a calming and quiet setting conducive for patients with autism. The Weill Cornell Institute of Geriatric Psychiatry has gained national recognition for excellence in specialized clinical care, research, and training in depression and other mood disorders of older adults. Our clinical services consist of personalized programs of care aimed at eliminating or reducing psychiatric symptoms and facilitating adaptation to limitations that are often a part of late life. Experts in psychopharmacology, psychotherapy, group therapy, family consultations and assistance with social support services provide complete support to our patients. We have an expansive research program ranging from biological causes of geropsychiatric disorders to novel treatment development to health services delivery research. The program’s research in geriatric mood disorders has been supported by the National Institute of Mental Health for nearly 30 years. The Outlook at Westchester provides a therapeutic inpatient setting focusing on recovery for females and males with eating disorders. 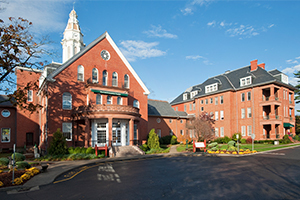 The program – a collaboration of NewYork-Presbyterian, Weill Cornell Medicine, and Columbia University College of Physicians and Surgeons, in affiliation with the New York State Psychiatric Institute – offers comprehensive diagnostic evaluations and programming that is developmentally appropriate for adolescents and adults. Our nationally recognized eating disorders specialists provide individual and group psychotherapy, as well as family therapy, accredited school programs and therapeutic recreational activities. Hotel-like amenities, gracious accommodations, and personalized services enhance the recovery experience for patients in The Haven at Westchester, an elegantly designed deluxe inpatient unit for adults 18 and older. Here, our experienced Weill Cornell Medicine clinicians provide expert treatment for mood, psychotic, personality, eating, and geriatric psychiatry disorders. The restorative environment includes spacious private bedrooms with baths and beautifully decorated living and dining areas. Patients are offered daily menu choices featuring specially prepared meals by a gourmet chef. Concierge services are provided, as well as a personal phone, computer access, and in-room television when a patient’s condition allows. A daily amenities fee is additional and is the responsibility of the patient. Our College Student Program works with undergraduate and graduate institutions in the tri-state area to assist with the management of students in crisis as they transition to college life. The unit operates on the principles of Dialectical Behavior Therapy and Cognitive Behavior Therapy, providing the optimal treatment approach. We provide individual and group therapy targeting coping skills and evidence-based care for mood disorders and first episode psychosis. Our staff partners with the student, family, and school to formulate the most appropriate and safest discharge plan. Our Borderline Personality Disorder Resource Center maintains a database of clinicians, agencies, and facilities nationwide with experience in the treatment of BPD and co-existing disorders. If you believe you or a loved one may have BPD or for more information , contact the Borderline Personality Disorder Resource Center at 888-694-2273 or at bpdresourcecenter@nyp.org. Only a mental health professional can diagnose BPD after a comprehensive psychiatric evaluation. Our compassionate certified social workers can help you determine the next steps for you or your loved one and connect you and your family members with resources in your area. NewYork-Presbyterian/Westchester Division is located in White Plains, New York, about 25 miles from midtown Manhattan. Take the Major Deegan Expressway North to Cross County Parkway East. Take Hutchinson River Parkway North to exit 23 (Mamaroneck Avenue) towards White Plains. Approximately 3 miles to right fork (Bloomingdale Road). Take a right at the fourth traffic light into the hospital entrance. Take the Whitestone Bridge to the Hutchinson River Parkway. Take exit 23 (Mamaroneck Avenue) towards White Plains. Approximately 3 miles to right fork (Bloomingdale Road). Take a right at the fourth traffic light into the hospital entrance. Take the New York State Thruway (I-87) across the Tappen Zee Bridge. Go 1 mile to Exit 8 onto I-287 East. Take I-287 to exit 8W. Keep to the left on exit ramp and turn left at the light on to Bloomingdale Road, opposite The Westchester Mall. Turn left at the first light at Maple Avenue intersection into the hospital entrance. Take the I-95 or Merritt Parkway South or I-684 South to I-287 West. From I-287 take exit 8 to White Plains. Follow Route 119 (Westchester Avenue). Turn left at Bloomingdale Road. Continue to traffic light at corner of Maple Avenue. Turn left at light into the hospital grounds.